Out of all the modernizations through time, that have affected the sport, hobby, or vocation of scuba divers, the electronics department has inarguably seen the largest leap forward. Thanks to heavy investment in consumerism, and the backing of manufacturing, the technological aspects of everything around privileged civilizations all over the globe has rapidly advanced. In this digital age, divers of all sorts have access to far greater technology to assist them in the preparation, understanding, and status awareness that was previously impossible, or at the very least rather rudimentary with pressure gauges and analog visuals of old. The personal decompression computers of the twenty-first century are often as small and simple as a wristwatch looking device that carries with it the computing power and atmospheric understanding to be a divers best friend out in the field. Some of these diving computers are even passable as normal watches between dives. Technology has come so far, but sometimes you just need the information that can save your life, and keep you safe. Diving is an exciting passtime for those lucky enough to live near water. It’s also an amazing way to expand your comfort zone and experience a perspective humans aren’t necessarily built to experience. Visiting underwater is a little like visiting space: you need to have the proper equipment to survive and thrive in the foreign landscape. With the Shearwater personal decompression computer, you’re able to do both. Ever snorkel has a different preference for how they set up their belt, equipment, etc. The snorkel that likes to have a computer attached by a classic strap mount might not understand the importance of this personal decompression computer coming with a bungee mount. The important thing to take away though is the fact that this mount has options and versatility that other personal decompression computers just don’t have. Yes, you read that right. The same batteries you get from the dollar store are able to power your dive computer at depths in the hundreds of feet. It might not feel like a big deal on the surface (after all, it seems like everything nowadays calls for AA or AAA batteries) but under the water the difference is huge. The battery life is longer than other traditional personal decompression computer batteries, and you’re never going to have to make a special trip for a special battery; you've got extras already sitting in your junk drawer! Those computers feel a little more expensive than other products out there, but they’re certainly worth the price. For a piece of equipment that’s able to follow you as you splash around in the depths of the ocean, you want a product that isn't going to fail. This personal decompression computer might be a higher-end price, but it’s a higher-end piece of equipment. You absolutely get what you pay for with this computer. Oceanic’s copy says that “the i stands for incredible” and we have to agree! These wrist watch style personal decompression computers are truly fantastic, and won’t take up much space. You want to keep your weight controlled when it comes time to snorkeling, which means small accessories are better. Carrying a heavy dive computer can throw off your balance. Avoid that with this wrist dive computer. This is a big thing in the world of divers. While we want to assume you know what this means without an explanation, not everyone who’s reading is super far along in their diving careers. And that’s okay! Air integration means that the personal decompression computer is able to read and record your airtime (how much longer you’ll get out of your tank) as well as the PSI status of your tanks themselves. Air integration is a huge benefit for any personal decompression computer to have, making it a truly standout part of this one. There’s a reason pocket watches moved out of fashion and the wristwatch took hold. Fashion has proved time and time again that we always come back to practical, as proven by the watch. This is especially true in a diving situation, where you want to be able to stay svelte and hands-free. Diving with a wristwatch on is much easier than diving with a bunch of gadgets strapped to you. When the benefits make it this much of a no-brainer, it’s hard to choose any other product. Cheaper than our first personal decompression computer (but still a little expensive for some), we feel that you get a good value for the cost. Due to its integrative technology, you’re not only purchasing a product that tells you to snorkel depth and time, but you’re also getting a product that can replace all your gauges and airtime readers. When there are these many products all in one, the value far outweighs the cost. There’s nothing worse than try to clip something on that doesn't want to be clipped on. Now you don’t have to choose between clips, straps, or ties. You can attach this computer in many different ways, making it easy to remove from your snorkeling suit and attach to your gear bag. The fact that you’re able to secure it, and then back up secure it too? Amazing. There’s so much security. Sometimes too many numbers on a screen can make us confused. Misreading could be terrible when you’re 100 ft underwater (or even more), resulting in panic and poor choices. That’s easily avoided with these two screens, which make up one amazing product. The analog pressure gauge makes it easy to read at a glance, while the computer screen gives you more detailed answers. Everything you could ever want to know! This product is a solid one for those that might be on the fence about switching over from analog to digital. By retaining the analog pressure gauge while integrating a digital personal decompression computer, even seasoned divers will be able to keep up. The rise of technology isn't a scary one, and at a very average cost this computer won’t make you feel like you put out too much for a piece of “old tech”. This dive computer is the epitome of balance, and very much worth the cost. This personal decompression computer will launch you into another world. The ocean is by far one of the most dramatic and interesting places to explore, but it needs to be done safely. If you’re getting your diving license or are working with an experienced diver, this is a great option for taking charge of your own learning. 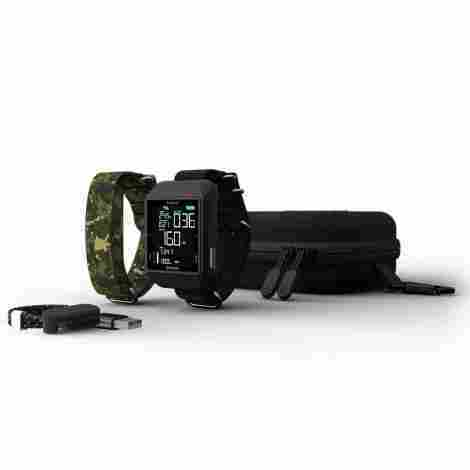 The watch possesses all the abilities you need in a solid personal decompression computer, as well as coming with all the additional equipment. This is truly an all-in-one deal. Why use a snorkeling mode? While only divers can answer that, we know that there are a couple different reasons. Being able to choose between free-diving, recreational diving, and technical diving means your personal decompression computer will be able to track exactly what you want to know. This is a great benefit of this computer watch, as many of the simpler ones don’t include this sort of detail-oriented stuff. If you thought the AA battery powered computer was a great innovation, wait until you try this one. This rechargeable waterproof computer is plugged in as easily as your phone or computer, making it simple to always keep the batteries at 100%. While some battery-powered computers recommend you change the batteries every time you do a new dive, this one is simple: plug in, power up, and go. The Cosmiq+ personal decompression computer is a solid product. While there have been a few reports of personal decompression computers that are unhappy with the quality of it, we feel that these are well balanced by people who are pleased with their results. As a snorkeling computer that’s on the cheaper end of the spectrum, we just have to say that you might be getting what you pay for with this computer. Shearwater really knows their stuff when it comes to personal decompression computers, which is why we had to include the arm strap version of the first personal decompression computer we looked at. While this one is quite a bit different from other, more simplistic personal decompression computers, it’s not at all hard to read or difficult to handle. You’ll be happy with this option, especially when you know you’re getting all the benefits of Shearwater with none of the hand-holding. You know when you walk into a room and forget what you came in for? That feeling can happen no matter how well you know your plan. You might be the most experienced diver in the world, but getting distracted by fish or adventure can end poorly if you aren't able to improvise underwater. By bringing a personal decompression computer with you that has snorkeling planning capacities, you’re essentially guaranteeing you won’t forget what you walked into the room for. Hey, this is a pretty great idea. Can we get one of these for day-to-day life too? One benefit that some personal decompression computers have, particularly this computer, is Bluetooth capabilities. You want to be able to automatically “sink” (see what we did there?) your dive logs with your computer. This is most commonly done through Bluetooth, which means you don’t have to spend the time inputting everything by hand. We thoroughly recommend a personal decompression computer with Bluetooth. The hours you save will be priceless. The reviews are exclusively positive on this computer, and the brand is certainly well deserving. Shearwater knows their stuff in the world of diving, making it possible for you to feel safe and secure even as a beginner snorkel. If you’re just starting out, it might feel like a big cost to pay upfront; trust us when we say that this product will last for many years throughout your diving career. It really is worth it. There’s something to be said for the brand of a product. Brands carry a lot of weight, especially when it comes to the world of snorkeling products and things that help to keep us safe in life-or-death situations. Cressi is a brand that truly knows their stuff when it comes to beginner divers. They’re a reputable company that’s perfected the basics, meaning you get all the stuff with none of the fluff. If you’re picking up a snorkeling computer for the first time you might get overwhelmed by all the buttons and doohickeys. Cressi has stripped away all that noise, bringing you a single button interface. This interface makes it simple for anyone to pick up and program, which means beginning divers won’t be lost up creek without a paddle. Backlighting isn't just for dramatic music videos and cartoon supervillains anymore. Back lighting is actually a huge asset when it comes time for night dives. There’s a special sort of romance to diving underneath the surface of a pool of dark, black water. 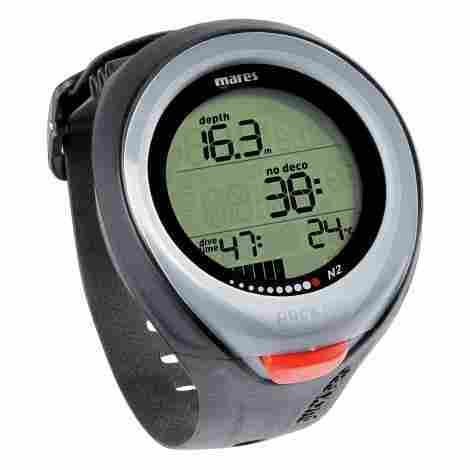 Now you’ll still be able to keep track of your dives by the large screen that lights up. All you need to do is press a button and BAM! You can see all your levels even in the dark. At one of our lowest priced options, this computer will do its job. The wristwatch-style is always a benefit, and Cressi definitely knows how to build a good user interface. Some reviews state that the quality isn't as high end as other personal decompression computers, but that’s okay. If you’re a beginner unsure if you want to pursue diving, it’s fair to invest a little less upfront. You still want something that works, though, which is why we recommend Cressi’s Leonardo personal decompression computer. 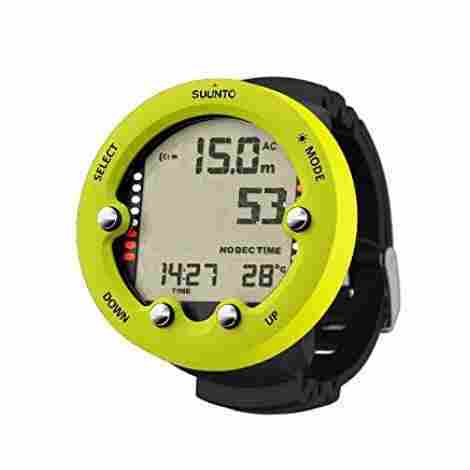 Another Suunto product, “Zoop” might have been put on our list solely because it’s fun to say. 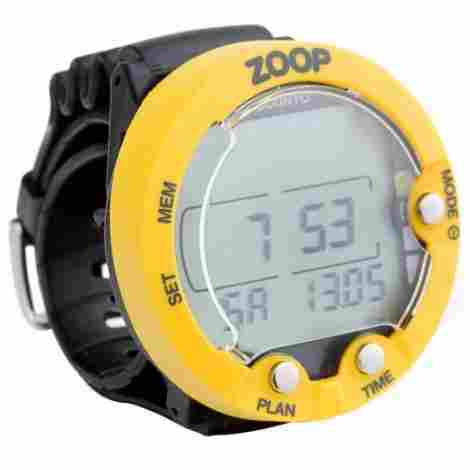 While the product is great, who can resist a fun word like “Zoop”? Not all diving devices have to be serious and gloomy. Just look at the fun yellow color of this wrist watch dive computer. You’ll always easily float through issues with this happy watch! Are you tired of buying a diving computer to keep track of everything just to find out when you open it that you need to learn a whole new measurement system? That’s no longer the case with this dive watch, as you can choose between metric and imperial. It’s even possible to switch between the two, just in case you and your diving friends have different measurement needs. Canadian divers will love this one. While we haven’t given any measurements regarding the screen size for many of these dive computers, this write-up offers a handy measurement guide to help those visually-minded folks. Visualize a hockey puck . See its glistening, hard, cylindrical body. Now imagine it on your wrist. That’s the size of the Zoop Novo. 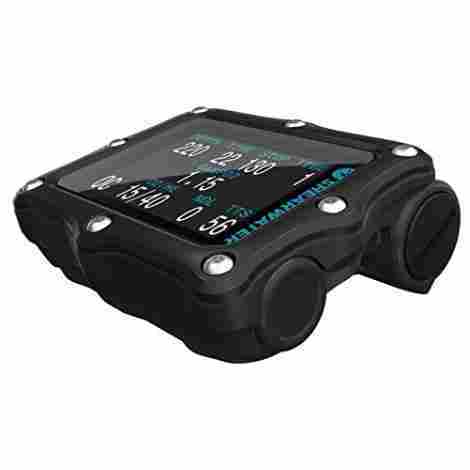 While it means you've got the equivalent of a hockey puck coming along on your diving mission, it also means you've got an easy to read display! 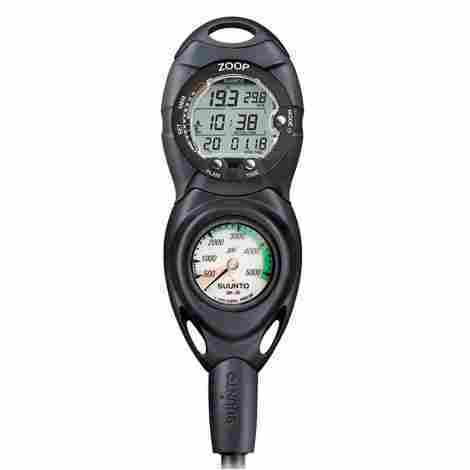 Many reviewers call this a beginner’s dive computer, but we believe it’s even more than that. Reviews from both beginners and experienced divers alike call this computer an excellent choice, with a huge amount of love for both the interface and the design. At an average price, this dive computer is really worth its cost. We’ve seen quite a few of the computers that attach like wrist watches, and even a few that attach to belts or sides with cords and cables. What’s the one computer we haven’t looked at? One that wraps around your whole body. This computer is less of an add on and more of an integral part of your diving outfit. You get safety and security with this diving outfit, as well as the knowledge that no broken wrist straps will result in a lost personal decompression computer. This durable vest is made of a material that was literally crafted to withstand the vigorous pressures and destruction of the ocean. The vest itself resists chlorine as well as salt, which means you can use it as a practice pool diving vest as well as an ocean vest. The durability extends to the computer parts as well, as all the instruments are made of high-quality materials that won’t break. In the same way that life jackets and straight jackets attach via straps around your body, so does this diving computer. While you might think it’s a little excessive to have a full-body computer, we believe that the wrap around aspect is a great asset. By wrapping the personal decompression computer around your body you ensure a snug fit and no risk of losing it during a tight squeeze on a dark dive. While it’s one of our most expensive list items, it’s truly worth the cost. This vest is unique in that it’s everything you could ever wish for on a personal decompression. You've got all your instruments attached to the vest, as well as the protection and durability that comes from the high-quality material. Plus, it’s even weight balanced. The value exceeds the cost by a long shot if you’re someone who dives all the time. We think that that’s excellent. 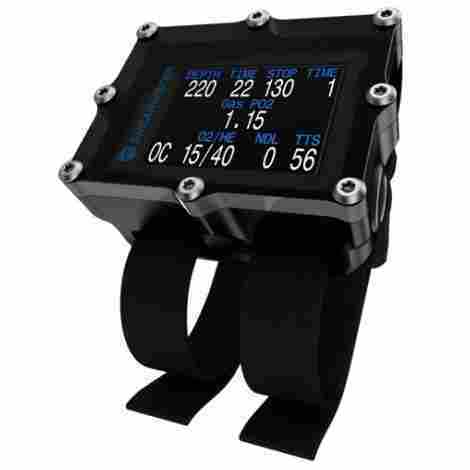 This is another wrist watch style computer that’s going to make your snorkeling habits easier. The way this computer works is like any other. It can tell you how deep you’ve dived and for how long, as well as reading a few other levels (like Nitrox). 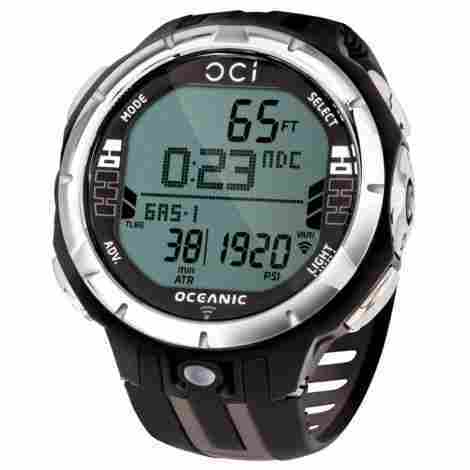 Most reviewers call it a good entry-level dive watch, and we have to agree! This is a reliable machine that will keep your head above (or below) the water when it comes to diving track. 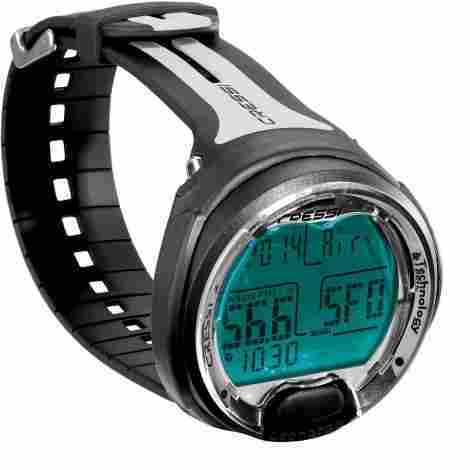 Unlike other wrist watch style snorkeling computers, the screen on this one is easy to read. While this could be because of the large size, we also believe it’s due in part to the uncluttered display. While other computers can muddy their screens with many numbers and clusters of information, this one ensures everything is clear and clean. You can’t hear dad say that dinner is ready when you’re underwater, and we’re willing to bet that your cell phone doesn't work at 100 ft below the ocean’s surface. By having a loud and easy-to-hear alarm sound you’re able to tell when it’s time to start swimming up to the surface again. This means you always know when to surface right in time for the barbecue, ice cream cake, or beach bonfire. At one of the cheapest prices on our list, this computer is worth it for beginners… But you may want to skip it if you’re a seasoned pro. While the machine is reliable, the uncluttered-ness of the display means you might not have all the details you want. It will keep your logs though and can tell you all the things a beginner snorkel needs to know. We definitely recommend starting with this watch and then moving up to a more intense piece of equipment. The end of our list has come and we've shown you quite the variety of personal decompression computers. Not only do we feel that you've gotten an excellent look at all different types, but you've also gotten a lot of good information regarding the benefits to different styles of personal decompression computers. This personal decompression computer is no different, as it’s got a large variety of benefits; some of which we haven’t seen yet on other personal decompression computers! One of those qualities we haven’t mentioned yet is one that seems to be unique to the Mares Puck Pro Wrist Computer. This personal decompression computer boasts an ascent rate counter, which is essential when you’re trying to complete the last portion of your personal decompression back up to the surface of the water. Ascent Rate Counter means you’re never going to have to wonder if you’re moving too fast or too slow, as the personal decompression computer can calculate it for you. Risk reduction is a beautiful thing. Invest in it with this tool. In the same way that one of our prior personal decompression computers had a loud alarm, this computer has loud safety settings. The computer will let you know both visually as well as aurally if there’s a problem with your snorkeling. These are serious problems, such as a nitrogen saturation or skipping a decompression stop. The computer will also alert you of a low battery. With so many safeguards in place, you can finally get your parents off your back about diving being dangerous. With this watch, you’re all good! While the price is middle-of-the-road, the quality is anything but. This computer is an excellent value for its cost and will last you a very long time. Reviewers are on the whole pleased with the product, with many reporting longevity of the watch. If that’s the case, you have to invest in this watch. All the necessary equipment, durable, and average price? It’s so perfect. All in all these personal decompression computers are great tools. Being able to track, control, and look back on your information is super important to a snorkel. Knowing what to look for in snorkeling computers is half the battle. You want to know that your products are going to withstand any and all snorkling situations. This means you need durability, clarity, and support. You can have it all with those personal decompression computers; we hope your next snorkel is smooth waters when you’re using these computers. Waterproof. That’s your word of the day, and ours (as we put this list together). I’m sure you can guess what the worst quality a personal decompression computer could possibly have is, right? Yeah. If your snorkeling computer is not waterproof, it’s no longer a computer of this kind. Rather, it becomes a small, expensive, place to keep a very small amount of water. The worst part is, it’s not waterproof, so it doesn’t even keep the small amount of water in there very well. Other factors of build that come into play might vary depending on the type of personal decompression computer you’re shopping for. If you’re looking for a wrist-mounted watch then you’ll need to ensure that the strap is made with extremely high-quality fibers, and has a gold standard in metal manufacturing, for those clasps and hinges are one of the few things keeping that display within eyesight. The last thing you want to do is waste energy, and oxygen from your tank trying to fly after a falling watch once you are in the water. Most of the items on our list, and on the market as a whole are also made of metals, and you should keep your eyes on the materials used there. As well with any rivets or secure mounts. The electronics are a lot harder to judge from the outside, but you should be looking for things like high-resolution displays, the longest battery life you can find, and the deepest amount of hard drive or built-in storage space available. There’s a lot to choose from when it comes to the variety of personal decompression computers on the market today. What you should keep your eyes on — and what we tried to accomplish with our selections — is a wide berth of various builds and capabilities. Personal decompression computers come in two standard forms in the twenty-first century. The first is the console computer that runs alongside your everyday run-of-the-mill pressure and compass (usually located on your chest, run from a line to your tank apparatus). The second is the more common for all-around divers, and that’s the wrist-watch style. 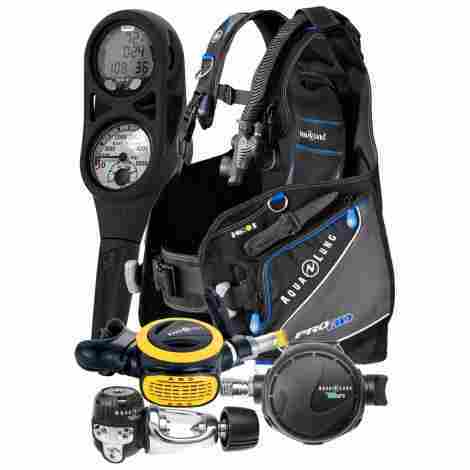 These are the contemporary diver’s main choice because you are not reliant on a true SCUBA set-up to use them. Watch style computers are extremely potent tools because you can use them in free diving, or snorkeling without any other needs to run them. They are strapped to your wrist, and your wrist should be with you at all times. Regardless of the physical, there are some things to look out for on the display itself. You should seek the best all-around device that gives you the information that you, as the snorkel, are looking for. Don’t over-step and worry about getting a waterproof computer that doesn’t show what you need, and not a bunch of stuff that you don’t. OH MAN! SPEND AS MUCH AS YOU CAN! These are computers designed to give you the information and safety guidelines that prolong your comfort, and even your life, underwater (where we weren’t designed to breathe and live, by the way). So skimping out here isn’t really an option that you should consider, and the market average for pricing isn’t really going to let you cheap out anyways. We attempted to find a great range of prices for our list but generally kept it above the budget realm because this is a hobby or vocation where things can’t be faulty. There’s an importance to spending the right amount, but what is the right amount? How we try to determine the proper amount or range for a product like personal decompression computer is to take the most premium product out there and aim just below that. We would, normally, contribute a ton of perspective options on our lists. A: Great question. There are many modes that are common across the entire market and it truly depends on the make or manufacturer that you’re buying from. Every waterproof computer should, and will have a mode for active snorkels — which includes depth bottom decompression limits. Other modes like the ability to record logs, active gauge modes, or even freedive mode that will lessen the structure of the information shown to you on the device. Some of the devices on our list, and in the market may only have a few of these modes, while the more premium or in-depth (get it? Diving pun … sorry) those computers could have all of these modes and a few more. But the ones we’ve listed in this answer are the general essentials. Q: Will it have alarms? Do I need them? A: Alarms are great. Especially when partaking in a practice where time is limited in resources, sunlight, or energy. The most common reason to use an alarm is an essential warning for the snorkel to let them know that they are at half-tank, or quarter tank of oxygen. This should, in theory give you enough time to return to the service (where there’s an abundance of air, hopefully) before your tank runs out. If you’re big into planning meticulously, which you should be if you’re going to venture into an atmosphere not suitable for the sustaining of human life, then you’ll map out your halfway mark, and will have factored in the time it will take to get back to the surface into your alarms. Do you need them? No. But that’s the dumb answer. 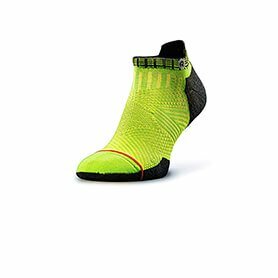 Should you have them? Absolutely. Q: Can I get the information off of the device? A: Many of the products we listed can store logs. The logs are continuously stored (internal hard-drive and memory space) data and fragmented information from your dives. When you put your computer into snorkeling mode, it begins the recording of all the data, and when you switch over to log mode, you’ll have access to that data. The higher-tier waterproof computers (and in our opinion, the ones that should be a top your list of potential candidates) allow you to plug your logs into a computer and save them somewhere else. Lesser models might make you take the data off manually. Q: What the max depth? A: That is a very good question, but unfortunately one without a specific answer. The best we can do is offer some advice, and that is to be keen, and pay attention when reading product descriptions. Many of the options we chose do not glaringly display the max depth, and in most cases you can assume that you’ll have to give up on your snorkel before your computer does, but to be safe, it’s good to make sure you know the number because you can’t really afford to keep guessing, and you for sure can’t afford to lose your readings and computer in the middle of the sea. Better safe than sorry, right?